The Mobile City Council voted unanimously today to put the $4.7 million the city received from its settlement with BP into the capital fund to purchase new public works vehicles. The money will be used to immediately purchase four new garbage trucks through a state-recognized cooperative purchasing program, Chief Procurement Officer Don Rose told councilors. Two more trucks will have to be built and sent down to Mobile, Mayor Sandy Stimpson added. The money would not only be used to buy garbage trucks — single-staffed truck that empty residents’ cans with a hydraulic arm — but would also go to purchase trucks for yard debris and other public works vehicles. During a recent finance committee meeting on Stimpson’s budget proposal, administration officials told councilors the city only has around nine garbage trucks working at any one time to pick up 18 routes. Although Councilman John Williams said since the money was going into the capital fund and not into a public works line item, the administration could legally decide to use the money for other capital expenses, Stimpson confirmed his office wants to purchase the trucks. 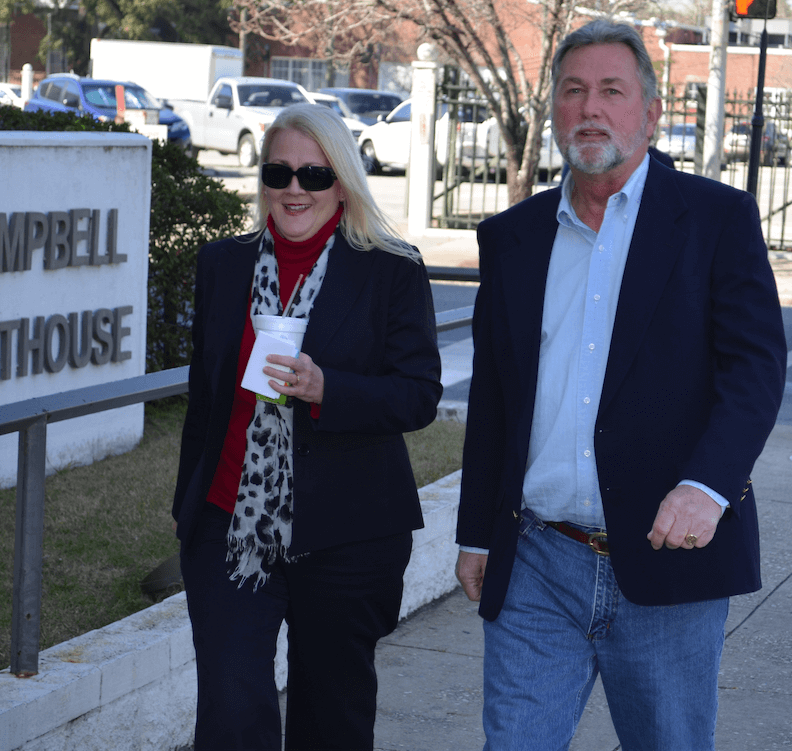 The Mobile City Council voted to deny the appeal of attorney Buzz Jordan of a Planning Commission decision to cap the occupancy of a new downtown entertainment venue at 100. Although he’s also the owner of a downtown building where another proposed entertainment venue was seeking a similar waiver, Jordan was at the meeting representing Ryan Johnson, who plans to open a building at the corner of Conception and Conti streets as an entertainment venue called The Merry Widow. Under the zoning ordinance, she is allowed to do so without Planning Commission approval, as long as its occupancy is 100 or less. Johnson asked for an occupancy of 150, but the commission denied the request Aug. 7. Planner Bert Hoffman told councilors the denial came despite staff recommendations based on an OK from the plumbing inspector. Jordan and Johnson both argued the area was mixed use, with as many as 10 nearby businesses. Jordan named several bars and restaurants in the area including Gabriel’s, Soul Kitchen, Alchemy Tavern, Saenger Theatre and others. “This has become a commercial business district,” he told councilors. Developer Todd Drummond spoke in opposition to the project on behalf of residents of the 10-unit O’Gywnn Condominiums across the street from the proposed venue. Drummond said the developments Jordan was referring to are a “fair distance” away from The Merry Widow. Drummond also said he can’t imagine fitting 150 people in the small building. He also complained about pedestrians “spilling out” into the street while in line for a performance, noise and about the parking situation. Jordan told councilors that pedestrians could be a problem at any of the business in the city. As for the noise, Jordan said that would be the same regardless of whether there’s 100 occupants or 150. Under the current ordinance, Jordan said, parking is not regulated for the building in its district. Hoffman confirmed that existing buildings did not have to make parking arrangements. During a public hearing dealing with demolitions of blighted property, a tax deed holder and her sister-in-law complained they weren’t given proper notification before property at 1221 Satchel Street was demolished. Beth Aaron, the sister-in-law of deed holder Diane James, told councilors James wasn’t notified before the demolition happened. She said she called after and was told notification wasn’t needed. The city charged James $2,900 for the demolition, after receiving bids for the work. Aaron said James had an estimate for the work at $750, but was waiting on the title to clear before doing the work. Cooper said the city is not required to notify property owners if the demolition is considered an emergency, which this was. The home on the property had almost completely been destroyed by fire in July 2014 and Cooper said it posed a risk to the safety of residents in the neighborhood. As for bids, city attorney Ricardo Woods said for emergencies, the administration can choose from a rotating list of contractors and the demolition isn’t part of a competitive bid process. Still, Aaron said the $2,900 seems a bit high for the demolition of what was left of the structure — a brick wall and two brick fireplaces. The council delayed a vote on the administration’s proposal to put a temporary ice skating rink at Cooper Riverside Park during the holiday season. Council President Gina Gregory said there were still some unanswered questions surrounding the $132,000 rental. Councilwoman Bess Rich had a question pertaining to 17 city employees who would be used in shifts at the skating rink. Senior Director of Community Affairs Shayla Beaco said seasonal employees who previously managed parks, pools and had other duties. She said they would be reassigned during the time the rink is at the park. Councilman John Williams said he was ready to vote Tuesday on the proposal and asked his fellow councilors if the answers to two outstanding questions would change their minds. Both Rich and Councilman C.J. Small said they were ready to vote, but weren’t opposed to laying it over one week.